Both engines are reported to have been refurbished at 2000 hrs (out of vessel). Main fuel tanks reportedly replaced Nov 1995, aluminum. Onan generator - 8kw (Model: 8mdkdb 12v/120, 60Hz/Phase 1) replaced by previous owner in 1997. Battery Charger: Promarine ProSport 12, new 2015. New raw water hoses to both engines and generator; new water pump (port engine); rebuilt sea strainers, May 2015. 2 spare props: 3 blade, D24" x P22 counter rotating. 7 Batteries: 4-house, 2-start, 1 generator. Steering: Hynautic (no auto pilot), new steering cylinder, lazybar and coupling hoses: May 2016. 1 - new 50', 50amp shore power cable. 2 - 25', 30 amp power cables. 2 - 50', 30 amp power cables. Bonus: 50 gals Delo 100 x 30wt oil for generator and mains. Three-filter water filter system by Diamond Water Systems, Inc for icemaker and bar sink. Two new heads with individual holding tanks (2016): SeaLand Traveler 711-M28. Each toilet has 8 gal holding tank which is transferred to main holding tank (40 gals) via pump with macerator system. All black water hoses replaced with Trident Premium Series hoses and valves for ease in maintenance. To board you may either use a stair for access to either port or starboard decks. There is a sliding door on the starboard to the interior at the lower helm. Or step aboard on the starboard stern swim step and enter the cockpit. The dinghy is attached to the swim platform via a manual Seawise davit system. The cockpit has rod holders and pulley for a pot puller which are mounted and ready, as is a Magnum BBQ (2015). A hot/cold water cockpit faucet is perfect after a day of fishing or swimming. The sundeck is fully enclosed and very spacious and has a large storage box with a cushion for seating. The flybridge is accessed via three steps with seating on an L-shaped settee and side-by-side captain's chairs. The front canvas and glass was replaced May 2016 - excellent 360 visibility! The flybridge and sundeck are open to each other and are fully enclosed with EZ2CY windows in canvas (including both doors leading to either side deck) to allow great entertaining spaces in any weather. The side decks with high rails provide a sense of safety for fender tending or going forward to deploy the anchor. Entering the spacious salon from the sundeck (or from the starboard side deck) you notice the beautiful teak interior, lots of natural light, the lower helm, and an easy flow between the salon, galley, dinette and forward stateroom. All of the spaces have tall headroom (approx. 6'3"), which contributes to the overall spacious feeling. The salon has been completely updated (2017) with new carpet, new blinds, an L-shaped settee, and new curtains. A very comfortable spot to enjoy watching TV or reading a great book! A U-Line icemaker, wet bar, wine storage and TV complete the salon. 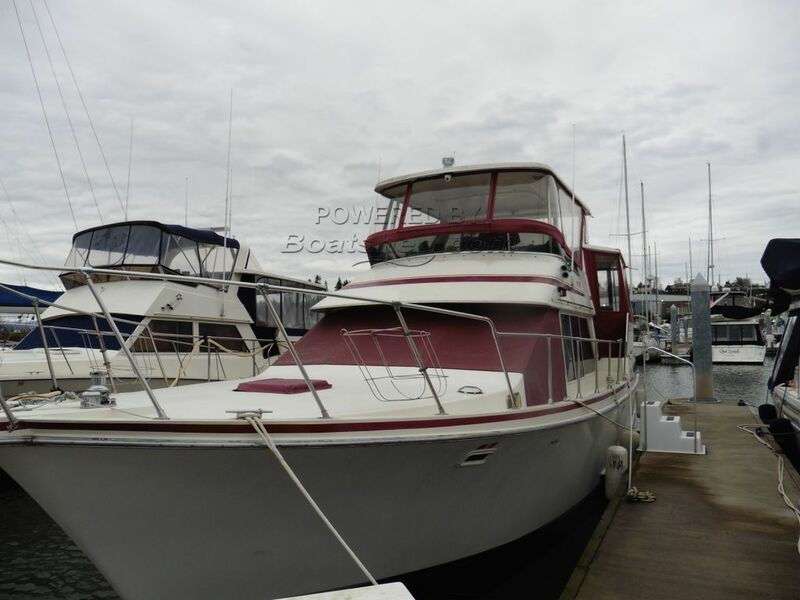 The galley, forward and to port, is fully equipped with a 3-burner Princess electric stove, microwave, new Breville convection oven, side-by-side stainless sink, Novacool refrigerator and freezer, and loads of storage. The under- counter cabinets have full pull-out shelving and baskets for ease of accessing all storage compartments. New flooring flows through the galley and dinette area to the forward guest suite. The dinette, across from the galley seats four comfortably and also benefits from the large windows above and has updated wall coverings. The central vacuum system is located just below the settee. Access to the engine compartment is either under the stairs to the galley or through the salon floor. The forward stateroom is private with ensuite head, v-berth and good storage. The sink is plumbed for a shower but needs a sufficient faucet for a shower. The suite cabinetry has been completely stripped and repainted, and new doors with new hardware for an updated look. Aft of the salon is the full-beam master suite with ensuite head which has been completely remodeled in 2017. The cabinets and storage locker to port are new construction along with updated lighting, new wall coverings, new flooring, new curtains, new sliding door, new TV and new laminate on the shelves. There is a separate shower in the head area that also has new wall coverings and updated curtains. Large windows to the cockpit above the bed and on either side allow loads of natural light. A centerline queen size bed with full walk around access and ample storage create a comfortable master suite to enjoy anytime. The LuneAir Marine reverse cycle heat/air system was rebuilt in 2017 and has 3 separate zone controls: guest suite, salon, and master to keep you warm or cool for your comfort. The engine compartment and bilge areas are a pleasure to inspect as they are clean and repainted. 275' - 5/16" galvanized anchor chain - (New May 2016) attached to 44#, Bruce Claw anchor. Winter canvas cover and summer shades for lower helm windows, worn but useable. Bow sprit and gelcoat repair 2017: previous roller and track were wrong setup for type of anchor. New stainless track and roller, pulpit reinforced to accommodate anchor weight and gelcoat repair due to damage sustained from anchor hitting the bow. Compass: Ritchie (2); Speed: Datamarine Dart; Radar: Furuno 1831 and 1948; GPS/Chartplotter: Furuno GP 1850DF; VHF: iCom IC-M55. Halon FireBoy fire system in engine compartment; three fire extinguishers: 5#, marine grade, new Nov 2015. There are also 3 smaller fire extinguishers available as well. Tollycraft 44s are highly sought after and have an excellent layout for living aboard – this one is no exception! The owners have completed an extensive remodel to the interior: new carpet, flooring, blinds, settee, cabinetry and much more. Large, generous windows provide an abundance of light throughout, and along with a tall height there is a feeling of generous space. The flybridge is open to the sundeck and companionway to the interior allowing a natural flow for living and entertaining. The flybridge helm has excellent 360 visibility! Her exterior has places of oxidation and all appear to be cosmetic. Her engines appear to have been well-maintained and are reportedly sound. Current moorage is transferable to the new owner! Note: Offers on the asking price may be considered.These boat details are subject to contract. This Tollycraft 44 Cockpit Motor Yacht Caterpillar 3208T Diesels has been personally photographed and viewed by Gretchen Miles of Boatshed Everett. Click here for contact details.